Not many pictures have appeared online yet but you can view more pictures at these galleries: 2D6 Games, IMGUR, GMorts Chaotica , Blood of Kittens(much better quality pictures here) and Dear Tony Blair. Thanks to Tex for the links. I was actually. Wasn't sure whether to put it in the Merch section or the Game section. I'd very much like a nice black with blues look to them. I was thinking going brown with the Runners though and maybe a silver/milk colour for the cowl of the infants. So what does the starter set include? In short, we don't really know yet. Thing is, it isn't just a board game. It's essentially a starter set for all three species for a big wargame. I just really hope we get good tournament support for it!! Colloquial language mixed with exchange rates is going to end up in some major confusion. I like the looks of Dutch and his buddy (can't remember her name). The Predator tokens look pretty sweet too. And I'm also liking the looks of the mercs - even I wish they'd have been full-on A3 dog-handlers. Yeah, that's one of the ones the Warzone people seem excited about. Jolly good. I was momentarilly concerned aliens weirdness was afoot. What the hell is with the marine type guy mounted on flying shark tailed dragon thing, at the back right there(between not-queenie and the royal-guard)? Is that a warzone mini which got mixed in? There's a bunch more on here: http://deartonyblair.blogspot.co.uk/ Nothing with amazing quality unfortunately. 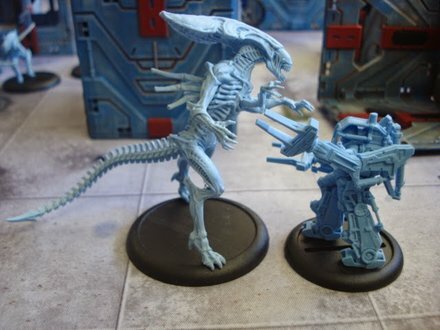 The stand-out stall for me, however, was Prodos Games - developers of the new Aliens vs Predator board game and war-game. I chatted with some of the team, and they were really open in terms of talking about the new game. There were several finished sculpts available for inspection. Prodos were also showcasing some updated token sets and the board tiles. They explained that these had been redone, as they were unhappy with the originals. The examples at the show were really amazing; very detailed, very colourful. It's great to see a company listening to customers, and acting on criticism or advice. Overall, I'm really looking forward to the release of this game and feel confident it is in safe hands! the little figurines do look pretty cool. I'll defenantly get the aliens just for display purposes. Hehehe. Didn't think about that, but you're correct. And brown'n'slimy will be easier to paint too. Another few pictures in here. I'll keep looking for more. And thanks. Very proud of it. And of my Month 6 win. I was flying with something that was completely scary to use but managed to pull out the full win.